Many kids who love to build with bricks also are STEM kids (Science, Technology, Engineering, and Math). E-Blox takes building bricks from STEM to STEAM (Science, Technology, Engineering, Art, and Math) by allowing kids to make creations with an artistic touch. What makes E-Blox different than the other building bricks is the Electronic Circuitry which takes the creations to a whole new level. 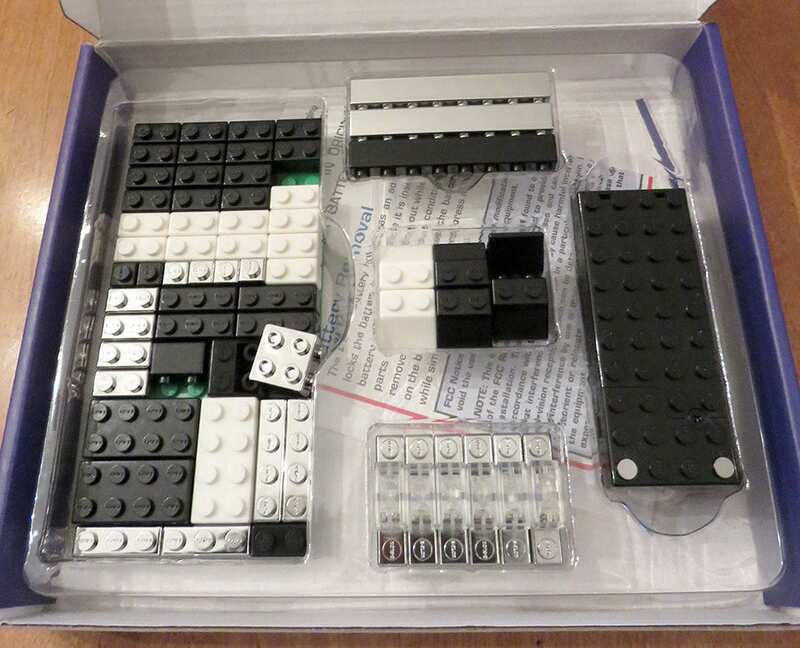 E-Blox bricks are compatible with the building bricks you already own, but the difference is in the tin-plated pARTS Line which connects to a battery block and then powers the electrical components in the bricks. When the bricks light up, the builder learns how to build a creation using STEAM-based technology, connecting the bricks with proper polarity, and placing the LED modules in the right series. If the bricks are not properly placed and interconnected, the power will not run through and light the LED modules. Learning the correct process for building enables the budding engineer to integrate electronic circuitry, use STEM knowledge of current, voltage, and electricity generation while creating a build. What’s unique in the pARTS Plus Line is there are no directions—the builders are free to create with the bricks in the kits. There are tutorials online for troubleshooting, if needed, on the product page. This takes the projects from STEM to STEAM. 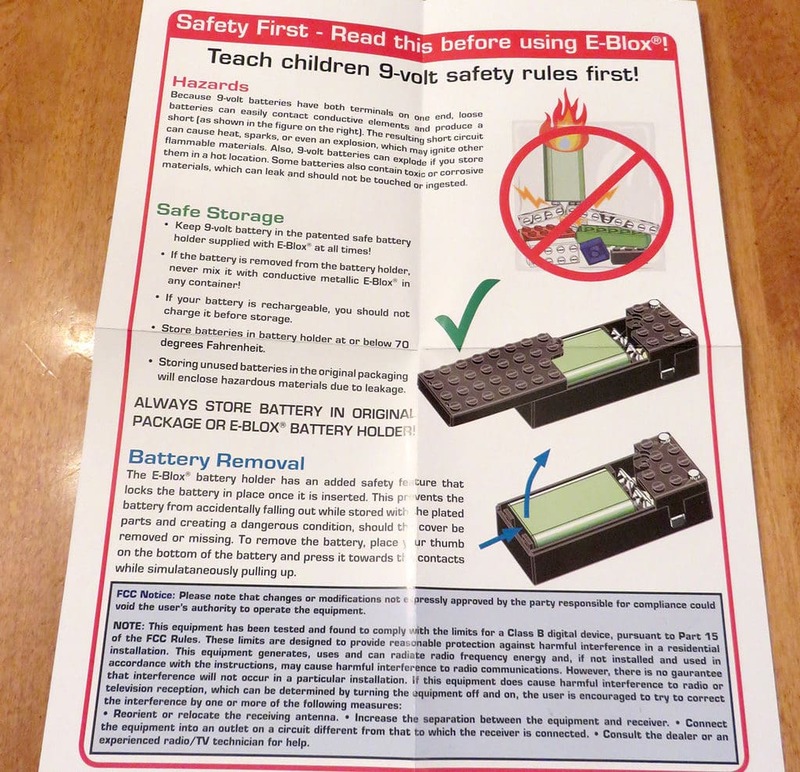 Because they do use 9-volt batteries, it’s important to supervise the kids and go over safety with the provided pamphlet. Our builder created the cat from the E-Blox pARTS PLUS kit quickly, but initially, it didn’t light up. He needed to go back and figure out where he missed a connection, and he was able to adjust the components to make it work. He did this on his own and learned the importance of making sure all the interconnection is placed properly so the current will flow from the battery, through the tin-plated bricks, and to the LED modules. The STEM and STEAM kids of today’s generation are the builders and coders of the future. E-Blox allows and promotes learning while building with science. E-Blox uses an exclusive and patented technology, and the compatibility with other building bricks makes creating almost anything in a child’s imagination possible. The basic skills learned can lead to building more sophisticated toys while having fun. 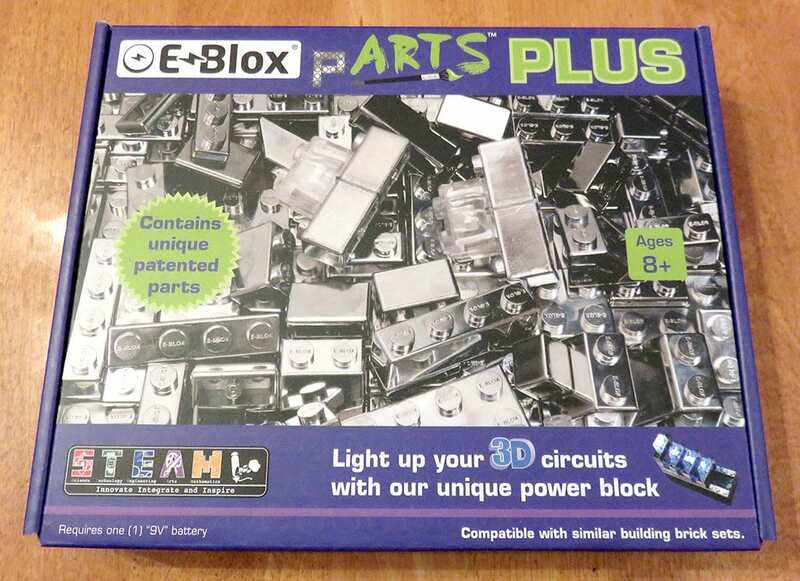 E-Blox are perfect for kids ages 8+. Learn more about E-Blox and explore their entire collection of building blocks at www.myeblox.com. The pARTS™ Starter Set retails for $32.99 and the pARTS Plus Set, the winner of the 2017 Creative Child Magazine Preferred Choice Award, retails for $43.99. You can also shop for E-Blox building blocks on Amazon.